A hazelnut orange lemon and amaretto breakfast muffin is all you need for a happy Monday! I have discovered a love of the vegan muffin, I think my fascination is equal parts 1) the taste and the moist texture of a good muffin, 2) the fact that you can make cake-like things without any of the traditional ingredients and they end up tasting better than many traditional variations. Eggs in a cake sometimes make for a dry cake, I have been to potlucks where many a homemade cake on offer, were sad dry things, not soft , not luxurious nor sensuous, only ok with a cup of hot coffee or tea. Unenjoyable. That said there are great butter, sugar and egg based cakes out there, of which I am addicted to a fair number, that I don’t think can be improved on in any way. Cakes made with love and chocolate and eggs and almond flour and butter and they are the GOODS, and I don’t think I will be giving them up anytime soon, – the Galette Bretonne is a case in point. Then there are meringues filled with fresh fruit and vanilla cream, and delicate sponges filled with vanilla and cream and covered with thin layers of marzipan. All good, all wonderful. However, this is not a post about all desserts,but about the not so humble and indeed often maligned vegan muffin. What I love about the vegan muffin is that it is so surprising. I fed my mum one, she of the “ooh Poli, this must be really healthy……..”. This time I didn’t tell her what was in it, till she told me what she thought. She asked for the recipe – and then I told her the ingredients “orange and lemon juice, ground hazelnuts or almonds, almond essence, some olive oil, some flour, a soupcon of amaretto, because if you have it you may as well use it” – and tadaaa or in this case TADAAA the muffin is divine. A treat, a revelation. Feeling virtuous in an idle moment I did some kcal adding and quickly realized that vegan it may be, low kcal it is not but then neither is a regular muffin (yes laugh if you must, the 100 ml olive oil were a dead giveaway, and I should know better, but where there is life there is hope). After this experiment I went on to make a pina colada muffin, using pulped pineapple and coconut liqueur 🙂 and from thence on to a fruits of the forest, dried plum and chocolate muffin. All vegan, all good, all coming to a blog post near you, specifically here. So for my Monday offering for last weeks fiesta friday ( you should have been there by now, fun on a friday I generally join on a monday, Angie posts great recipes, wonderful photos and hosts a fun party and also has LOTS of recipes on offer )) I give you the vegan hazelnut orange muffin! 11/2 tsp baking powder, additional 1/2 tsp Kaliumbitartat baking powder (Weinsteinbaking powder which contains Natriumbicarbonat, Kaliumbitartat (=Weinstein) and starch (I have no idea what this is in english, I bought it on a whim, apparently cakes rise better with it, but you could just use 1 tsp baking powder the normal stuff. You will end up with a very fluid dough, this feels wrong but turns out ok, at least it did the way I made it above. Preheat oven to 180°C, get a muffin tin ready, put in some paper cupcake molds, it is so much easier, fill around 14 molds. Put in the oven and bake for around 20 minutes or until toothpick inserted into the centre comes out clean. The recipe above is a very loose adaptation of one I found here at the blog a bit of the good stuff, I have twiddled and fiddled with it, is it better than the original who can say, I can say I have made it a couple of times since and loved my version every time! 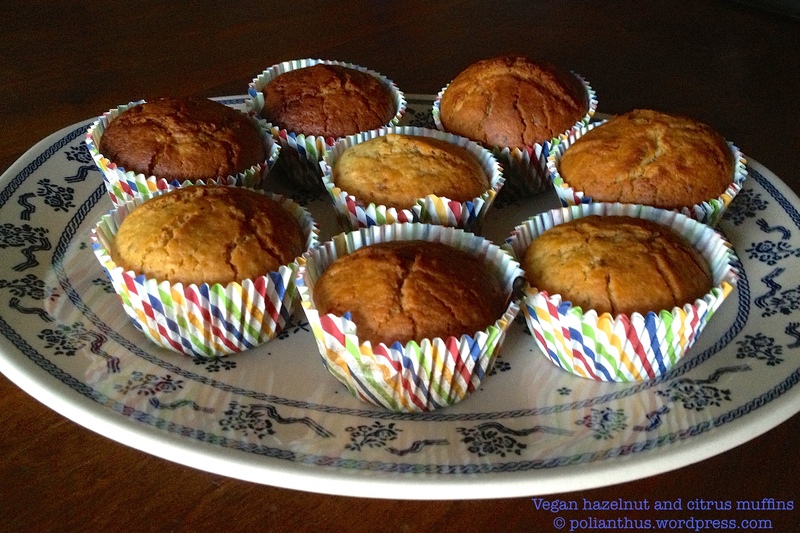 This entry was posted in bread/baked goods, Desserts, Random thoughts and daily musings, Recipes, Snacks and tagged almond essence, amaretto, amaretto hazelnut breakfast muffin, fiesta friday, hazelnut, lemon, orange, orange juice, vanilla essence, vegan muffin. Bookmark the permalink. Yes bring them on sista! I enjoy the Fiesta through you! hello my dear – every monday instead of friday, for some reason I find more time on a monday 🙂 have a great week ! I love vegan baked goods, made a vegan chocolate cake once that was better than it’s dairy laden counterpart. The muffins sound amazing. yes I agree 🙂 it is all about the inner values and that big oomphy sunshiney personality that they have! I also converted to vegan cakes (at least for what I call ‘everyday’ cakes some time ago. This will be added to the repetoire! Love your comment to add amaretto because if you have it, you might as well use it! funny (and true). Need dinner party inspiration? Check out The Dinner Party Collective!